Wednesday November 22nd 1893 It was late when we got up. I was busy about the house in the forenoon. We had an early dinner and Will went for wood. I went over to the church, got home at four oclock. Mary & Jennie Woolf were here awhile. I got supper over and read and wrote in the evening. weather cold and wintry. 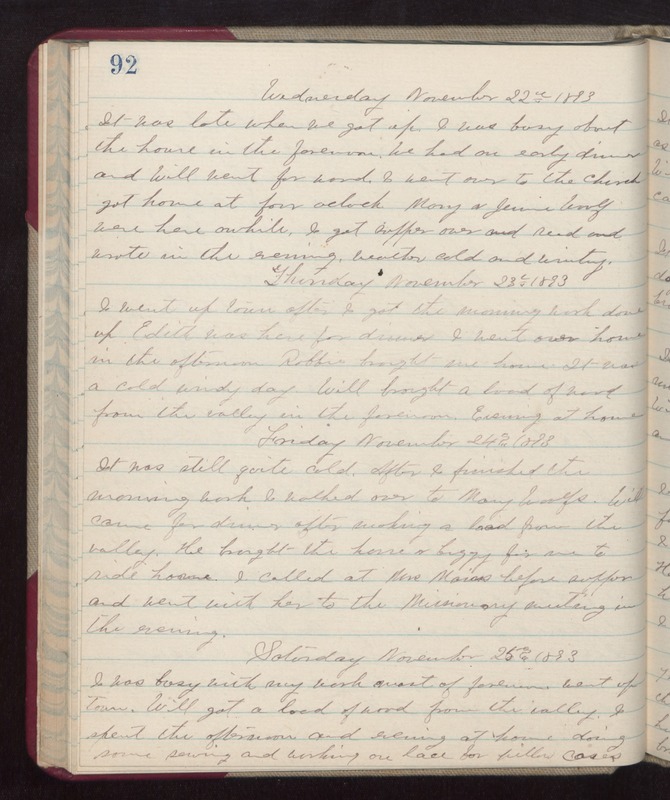 Thursday November 23rd 1893 I went up town after I got the morning work done up. Edith was here for dinner. I went over home in the afternoon. Robbie brought me home. It was a cold windy day. Will brought a load of wood from the valley in the forenoon. Evening at home. Friday November 24th 1893 It was still quite cold. After I finished the morning work I walked over to Mary Woolfs. Will came for dinner after making a load from the valley. He brought the horse & buggy for me to ride home. I called at Mrs [Mains?] before supper and went with her to the Missionary meeting in the evening. Saturday November 25th 1893 I was busy with my work most of forenoon. Went up town. Will got a load of wood from the valley. I spent the afternoon and evening at home doing some sewing and working on lace for pillow cases..